The featured 10 oz Silver Bar Prospector is in mint condition and easy to recognize. A wonderful design which has been around for years this beautifully struck bar is minted in such a way as to produce alternating frosted and reflective surfaces – a unique security feature. It also comes in a custom soft plastic holder which is excellent for long term storage. This mint condition bar is popular in the trade so the buy and sell prices are easily found and verified. 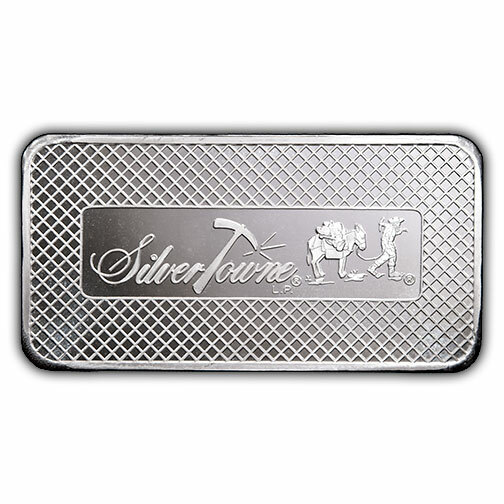 The 10 oz Silver Bar Prospector contains these hallmarks in relief: (1) the purity of the bar is defined (.999 FINE SILVER). (2) The weight of the bar (10 troy ounces). Advantages of the 10 oz Silver Bar Prospector include: (1) because of the bar’s uniform weight and size customers can easily track value by following the daily buy/sell prices. 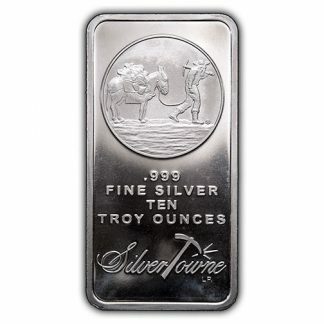 (2) The 10 oz Silver Bar Prospector is handy for smaller transactions providing a wider investor audience. And this size is easily stored in bank deposit boxes. (3) The price paid over “spot” is small because the bars are bullion. (4) The 10 oz Silver Bar Prospector is an ideal form of barter in case paper currency is questioned. Silver is also an industrial metal because it has many uses in technology. And as world industry grows the need for silver increases and may push prices higher. Investment has also increased since the use of silver in most US coinage was discontinued in 1964. 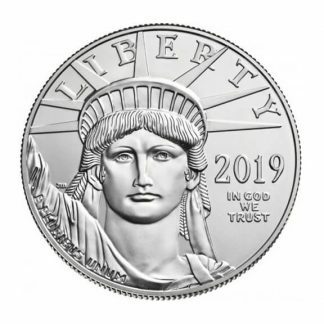 Today many people see silver as real money and a store of value as paper currency loses value through inflation. 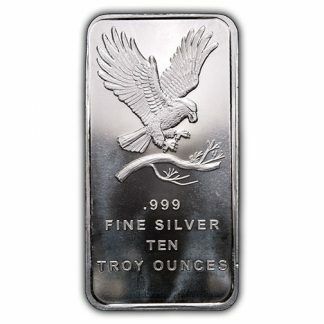 There is no reporting requirement when purchasing 10 oz silver bars. The sale of 1000 ounces or more in silver bars is reportable on I.R.S. Form 1099B. The sale of less than 1000 ounces is not reportable.